A tiny house may not always work out as a permanent home for everyone. Shawn and Jamie Dehner of the Small House Catalog have lived for the past two years in one of their own designs called the Moschata Rolling Bungalow. This orange delight cost $17,000 to build, sits on a lot the couple owns and contains a full kitchen where they are able to cook and bake, a bathroom with a sink, an RV sized tub and a shower and toilet. The vaulted living room has window sills that are wide enough for their cat to sit on and the sleeping loft has a queen size bed. However, the building codes in their home of Point Roberts, Wash. requires that they build a permanent home within two years. Their new home will be 700 square feet and the Rolling Bungalow will become their company’s office. 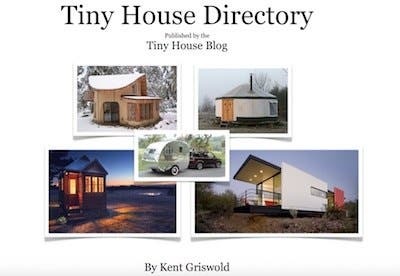 The Small House Catalog designs, drafts and occasionally builds small houses and tiny “rolling” bungalows. Their designs are influenced by the kit houses and bungalows of the early 20th Century and are cozy, comfortable and stylish. Both the houses and plans are also affordable for the average person. Several of their plans include the Beekeeper’s Bungalow which is 680 square feet and costs $249 and the 200 square foot Tinka which is free to download. The Small House Catalog also has a great blog that covers a multitude of small and tiny house issues including design aesthetics, small house styles and reviews. The couple will not leave their rolling home without some regret. Shawn and Jamie are now sharing their rolling bungalow with others. They are selling the framing plans for the house for $10. 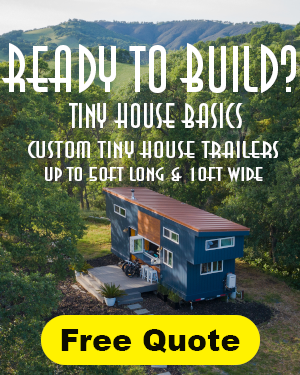 “Whether you stay in a tiny house permanently or end up building, you’ve got a perfect guest cottage that you can share with friends, family, sell or rent out.” Jamie added. Thanks for all you do Kent! That is a gorgeous house, totally inspirational. 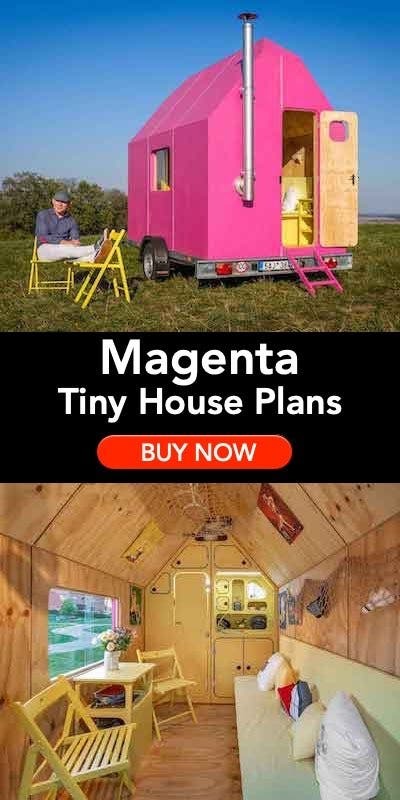 We might be building a tiny house soon so I’m seriously looking around for ideas. Thanks for the great pics to add to my ideas folder. Wow! I absolutely love the orange facade! It is about money. If people are living in portable structures, housing prices drop in that area. What company made the the toilet/sink combo? I’ve heard about it for Japan & Australia but didn’t realize it was in North America yet. Has anyone seen any other variation of this such as one who has the sink behind the toilet in sideways mode? The toilet sink combo is made by Sink Positive and it’s a great inexpensive add-on sink for a lot of toilets. Although acrylic, it works quite well. If you’re buying for longevity you might consider something like the Caroma Eco friendly Toilet-Sink all-in-one porcelain unit. 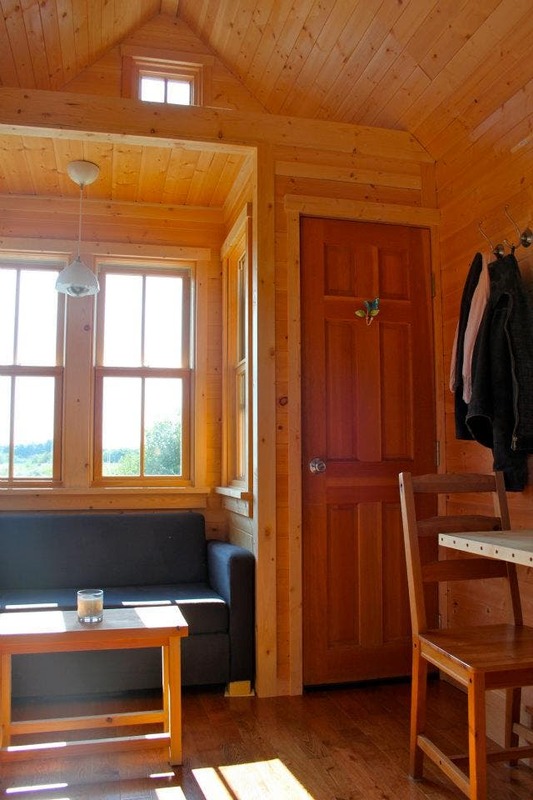 Zoning laws are what dictate whether a Tiny House can be a full-time residence in our town. Officials see our tiny house as an RV (as opposed to a house) and no full-time RV-style living is permitted in our area of town unless it’s a temporary (max. 2-years) builder’s cottage. That’s all okay for us since a small house makes more sense in our case; we do a ton of scratch cooking, canning, woodworking, etc. from home and it’s hard to imagine living permanently in a tiny house. I’m also a piano player so it’s tough to squeeze a piano in a tiny house! All that said I agree that people should be able to live how they wish barring damage to place and neighbors. Jamie has blogged a bit about that, if interested. Glad our work is inspiring to some, good luck and best wishes to all! Shawn, have you found any good designs for pianists who want to downsize? I’d love to keep my very small 4’10” grand and have a space that sounds decent acoustically (not so small that it overpowers the space). I don’t know if this is a realistic expectation! Love love love it. Especially the color! Unfortunately, placing a tiny house on the ground just about anywhere in the country would subject it to prescriptive codes. That’s where the hassles begin. Out here our tiny house would need to meet the current IRC – in addition to our locally created and enforced codes. One of the great things about using a trailer foundation for a “house” is that the structure is outside the jurisdiction of building code enforcement (for the most part). It is however (typically) still subject to zoning laws. And that’s what we’re experiencing here. If I’m not mistaken it’s the same issue Jay Shafer of Tumbleweed dealt with before moving into a small house too. It’s one reason I see small houses as preferable to tiny ones as a long term living plan. Jamie and I like both though, a lot. Both definitely have their places. My understanding is that once the structure is placed on a foundation, it is then considered permanent. 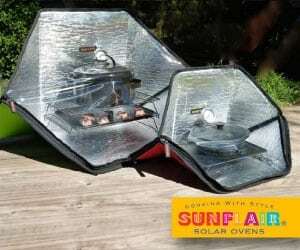 It cannot at that point be any larger than 100 square feet, and may not be used as a residence. Generally speaking, (and I’m sure this varies somewhat from city to city) they will allow for an additional residence only with approval and if the lot is larger than 10,000 square feet. The 100 sq. ft. limit you mention suggests strongly that the intention of the zoning legislation for your area is intended for something like a shed since the IRC – and no building code that I’m aware of going back to BOCA 1996 (and probably before then) – will permit such a small living space due to alleged (and some valid) safety issues, etc. Accessory dwellings, which have things like plumbing, and are intended to have people sleeping in them, are yet another challenge altogether since they face much higher permitting standards. I really don’t know of any way to design a house that small to meet any modern code. When we first got married, we lived in the house my husband had, which was just about the same size – 700 square feet. It was small! Yours is so cute! Very nicely done. 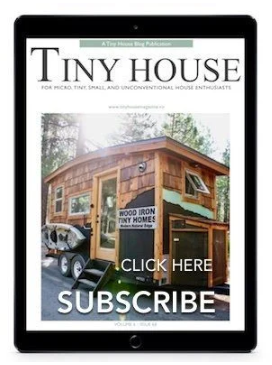 County and city tax bases would suffer if tiny houses invaded smaller houses equal less tax money . So minimum size zoning was established . I think this house looks great! Wouldn’t it be nice to see a change in the codes that would fairly allow ‘tiny’ siting? Most of the code is already there, but generally isn’t worded to fit tiny houses on wheels. Most municipalities just don’t know where to categorize them — so they either look the other way (tolerant), or outright forbid them. Really, tiny housers ultimately will have to deal with septic, waste (toilet compost), utilities, and tax… just like any other building. Some code is ridiculous, of course, i can echo that, but the vast majority of code is concerned with human safety and environmental impact. Skipping it altogether doesn’t seem like a good long term solution. By the way: That is a darn gorgeous house! And orange too. I assume most of the small houses in the catalog are not meant to be moved. Why then do the porches have to be on the gable end, unless of course you are on a narrow lot. Why not turn the house around and rearrange in the interior so there can be front and rear porches dramatically increasing your seasonal living space and close in the gable porch for more interior space. Wrap around porches would be even better for those of us who like porches (as opposed to decks). That’s right, most of our houses are designed to stay put. 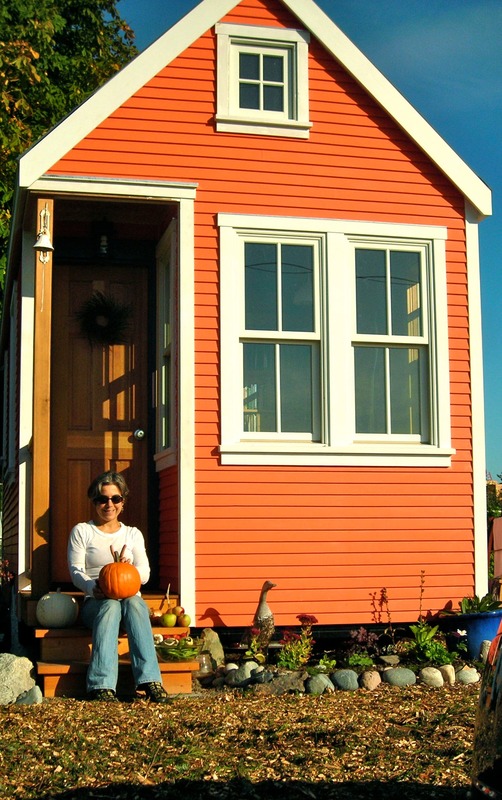 While we like tiny houses, we see small, stationary houses as a longer-term solution for most people. As for porches, well, they can be modified without much fuss typically, especially for two story designs; just add a wrap-a-round. But we like to keep the plans simple (and inexpensive to build) allowing individuals to add-on as they desire and can afford. That said, we’ve got plans with larger porches in the works too just as you are describing. Hang in there while we’re building because new plans are coming along! Thanks for your thoughts. My family have property in Point Roberts. I wonder if you know of South Beach House? My aunt and uncle own it. 🙂 I love it there. Hi Rhonda: Yes, we’re right down the street from South Beach House! We’re at the corner of Edwards and Largaud (right across Edwards from the water). If it cost $17,000, and you are only allowed to live in it for 2 years, then it really only saved you $5,000 over the rental, right? Is that really worth the smaller space? I don’t know many relationships that could withstand two years in that small space. Yes, our tiny house cost us $17,000 to build. $5,000 per year for rent?! If only…this is the West coast, it’s not cheap to live. Our cold, dark rental was costing us $9,000 per year ($750/month plus electricity, which was another $200+ per month in winter). So we’re actually talking closer to $20K at the end of two years. That’s a $3K profit plus we have the option of renting or selling the tiny house. As for being able to live in a tiny space together, it’s not been an issue at all. 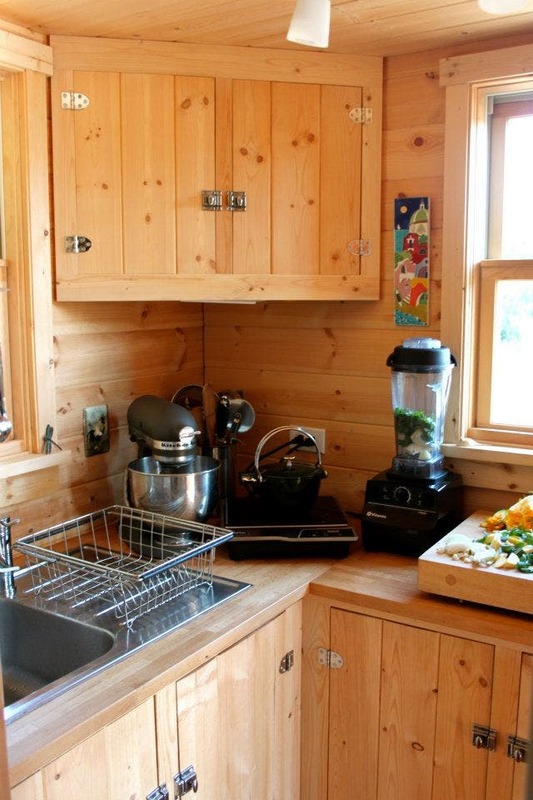 Sure, we look forward to things like a bigger kitchen and a soaking tub but with all the work actually building a small house, gardening for months on end, and other activities, our tiny house has been a great place to have dinners, read our books in the evenings, stay clean, sleep, etc. So, for us, it absolutely was worth the tiny space! It wouldn’t be the thing for everybody but when it came to dollars and cents it made perfect sense for the two of us, as you can see. Besides, what a fun experience! Can you tell me where in the USA that toilet/sink can be purchased? Susan, the sink addition to the toilet is from Sink Positive and can be found on Amazon. There are other designs as well. Could you please tell me where you purchased the toilet/sink? 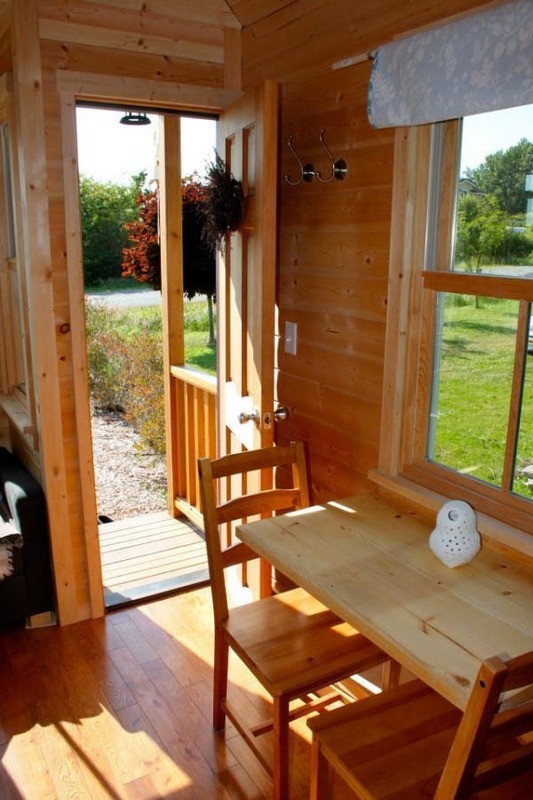 Would the bylaws allow you to keep a tiny home permanently if it was just a summer home for six months? 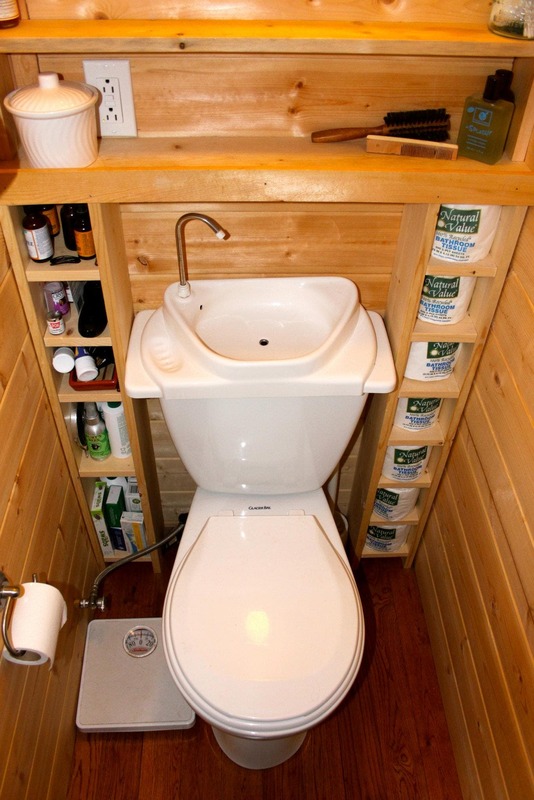 Where did you find the one piece sink and toilet combo? This post is only missing a picture of the Profile Smart toilet by Caroma. 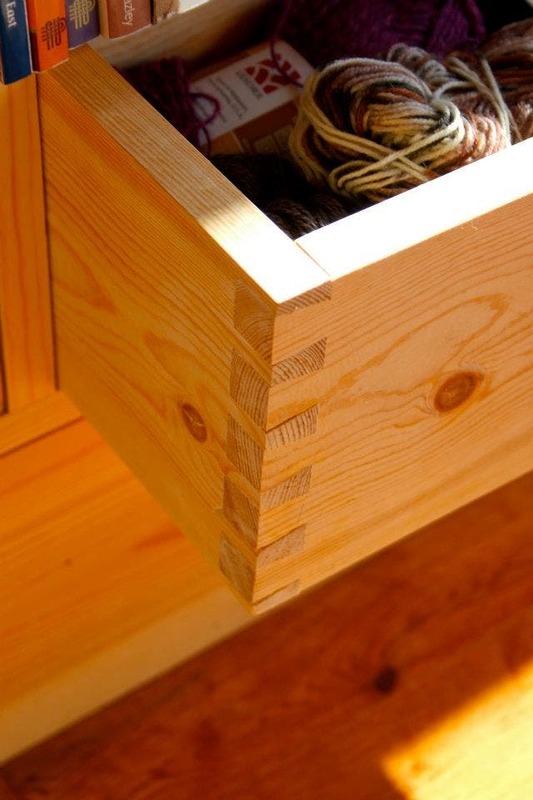 It has an integrated in built right into the top of it. Not to mention it only uses 1.28 gallons per flush. Here is a link to that exact toilet you can buy. 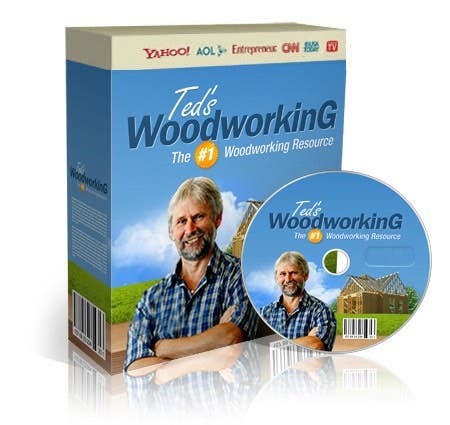 These things are very popular in the states due to the tiny house boom.